Door leaves up to 2500 mm are hung in aluminium moulded frame with minimum 2 pcs of stainless steel hinges of class AISI 304 according to EN 1.4301. Altogether this minimised construction causes less operational forces working on the doors’ hinges, lock, door closers, this having a direct positive effect on enhanced functional durability. Fire resistant doorsets DFM DS and wall hatches are characterised by distinctively stiff construction. The door leaf is built up of two steel skins 0.75 mm thick edged with rigid rebate 18 x 18 mm, and is peculiarly light due to special filling- rockwool 140 kg/m3. 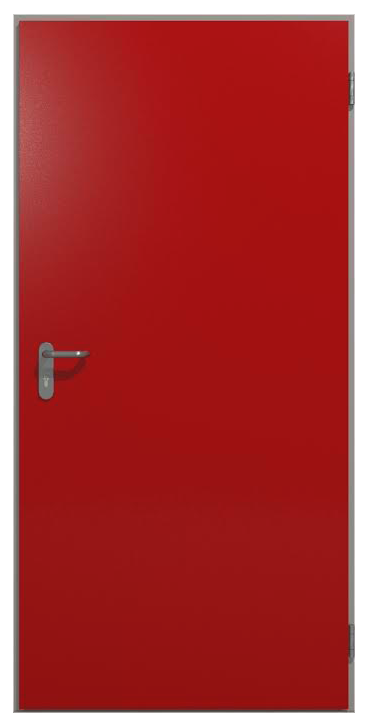 Total thickness of door is 65 mm and weight- 27 kg/m2. Steel doors DFM DS are standardly fitted in with aluminium moulded frame. This ingenious solution effects in high aesthetics and quality of installation of door frames in all wall types. The undisputable advantage of such door frame construction accompanied by the rigid rebate of door leaf results in noticeable minimising of structural opening required for installation of fire doors. Door leaves in basic variant fulfill the requirements of class 3 of mechanical durability according to EN 1192 and class 5 of mechanical resistance according to EN 12400 for 200 000 cycles of closing and opening. Thanks to usage of aluminium door frames DFM offers an ingenious installation standard. Instalation studs are threaded are threaded through the flanges of our customised hinges and through riveted-in casings for lock and security pins. These personalised elements contain factory punched holes corresponding with holes in door frame. Such reinforced installation takes off the door leaf load off the door frame, transferring it directly to the wall. In this way the tensions and deformations typical for steel frames are eliminated and aesthetic assured. (The studs are invisible).